Law and government, are or should be, the expression of the will of the majority, for the purpose of making collective decisions, taking collective actions, fixing problems and righting wrongs. If I gave that definition to most people as what government “should” be, or even what it is, I’d guess they would agree. But that’s not what law and government are at all. In fact, that notion of the nature of law and government, is not only wrong, it is extremely harmful. What are law and government? Government, is the instrument of collective delegation of the legitimate initiation and use of force against others. Law, is the body of rules by which that force is administered and applied. The only legitimate purpose for which, is to secure and protect the rights of individuals governed by them. So, what’s the other thing, and why is this a problem? The other definition, is more properly that of society (as distinct from culture). This conflation of government, and society, is a very serious social and political problem because those who hold it… and I firmly believe it’s a large majority… believe that law and government, should be used for “doing what’s good, and stopping what’s bad”. They naturally wish to see government do what they think is right, or best, and stop that which they think is wrong, harmful, or wasteful… And not just in areas where force should be applied. They conflate “legal” with “good” and “illegal” with “bad”, and try to make laws against things which they think are bad, or mandating things which they think are good. They often even conflate “legal” or “attempting to make legal” with “approving and supporting”, and “dissapproving and opposing” with “illegal” or “attempting to make illegal”. We have allowed… even encouraged people… to deeply hold the fundamental notion, that they get to vote on other peoples opinions, choices, and behavior; and if their “side” wins the vote, that it is legitimate to make those things legal or illegal. It also means that these people automatically and reflexively try to solve personal, moral, social, or societal problems, with government and law, when it is entirely inappropriate, even harmful, to attempt to do so. Most of those problems cannot be solved by the use of force;, or at best can only be solved inefficiently, ineffectively, and while violating the rights of others. In encouraging this misapprehension, we have in fact made the personal, the political, and the political, the personal. How do we stop the harm? We must correct this critical error in peoples fundamental apprehension of law and government. 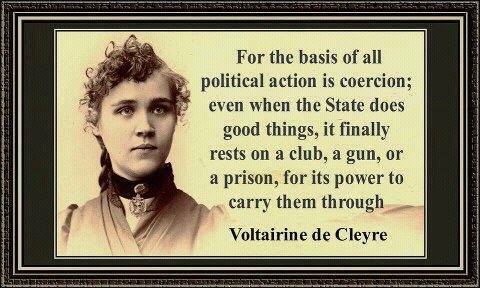 People need to understand, at the most fundamental level, that government is force, and that law is how that force is directed and administered. No more, no less. If we don’t correct this misapprehension, then we will continue to simply seesaw back and forth between majoritarian tyrannies, as social changes dictate. Rights will continue to be violated and abrogated as the opinions of society fluctuate. The favored, will continue to be privileged over the disfavored at the expense of the disfavored’s rights, until the pendulum swings again and the roles are reversed. Yes, I realize, that is largely how it has always been… But never has law and government had such a depth and breath, had so great a reach into our personal lives, as it does today, and this unfortunately shows no sign of receding. The absurdity of this reach… and overreach… is finally becoming apparent to many people, on all ideological “sides”; be it the “war on drugs”, the “war on terror”, privacy and surveillance, or gay marriage and wedding cakes. Use this growing awareness of the overreach, to help people understand. We have to show people these aren’t just outlying excesses. That they result from the way we think of, look at, and attempt to use, government. We have to get people to understand, that if they can say “there ought to be a law”, and then get a law made banning something that they don’t like; then their worst enemy, can get a law made banning something they love. We have to return to the notion that fundamental rights matter, and that the only legitimate purpose of law, and government, is to protect those fundamental rights. That’s up to individuals, and to society as a whole, NOT GOVERNMENT. Voluntary collective action. If it’s really what people want, then they’ll work for it, without the threat of force. If it’s not really what they want, then we shouldn’t be forcing people to do it.